VisitLEX (the Lexington Convention and Visitors Bureau) does not sell, rent, loan, or give your email address or other personal information to anybody. On some pages, you can make requests and register to receive materials. 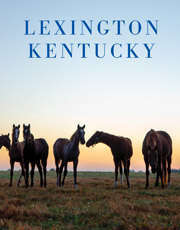 The types of personal information collected at these pages are: Name, Address, Email Address, and Phone Number (if you offer to provide it), and your specific interests related to visiting Lexington (if you choose to provide that information) as well as your anticipated travel date (if you choose to provide that information). You can visit all the pages on our site without giving us any information about yourself. But sometimes we do need information to provide services that you request. We do not share this information with outside parties except to the extent necessary to complete that request. If you provide an email address, or register to receive e-communications from us, you may opt-out at any time. Each time we communicate with you via email, you will have another opportunity to cease further emails from VisitLEX, or "opt-out". We do not share our email list with anybody. If you receive emails or postal mail from us and decide that you do not want to receive any future mailings, you may call us at 800-845-3959 or email vacation@visitlex.com and ask to be removed. You may also use this phone number or email address to notify us of a change of mailing address or email address if you wish. You may also contact us and ask that our personal data about you be deleted. We use non-identifying and aggregate information to better design our website and to share with industry partners or advertisers. For example, we may share information about the number of individuals who visited a certain area on our website, or the number of people from a particular zip code who registered for information, but we would not disclose anything that could be used to identify those individuals. Should you have other questions or concerns about these privacy policies, please call us at (800) 848-1224 or send us an email at admin@visitlex.com.